Mouthguards prevent the most common sports injuries to teeth. While the money is going towards a healthy and fun-filled life, it is understandable that families need to keep additional costs to a minimum, while at the same time keeping their children safe and happy. One of the most common sports injuries, and the one with the biggest bill, is damaged teeth. Here is everything you need to know about mouthguards – from what kinds there are to how to fit one properly – so that you can be sure that your child will be just as safe on the field as they are when off it. SO, What are sports mouthguards? Mouthguards are thick plastic protective devices shaped like a dental tray, which form to the shape of the teeth, gums, and mouth. The mouthguard creates a barrier between the upper and lower teeth to prevent them from crashing together during impact, as well as protecting the teeth from being hit by something outside of the mouth, such as a puck, stick, or ball. Fortunately, most sports teams recommend or require mouthguards to be used by athletes, but even in the cases where they are not required we still recommend them to be worn at all times – especially during high impact sports. With the possibility of costly dental bills, it’s better to be safe than sorry. 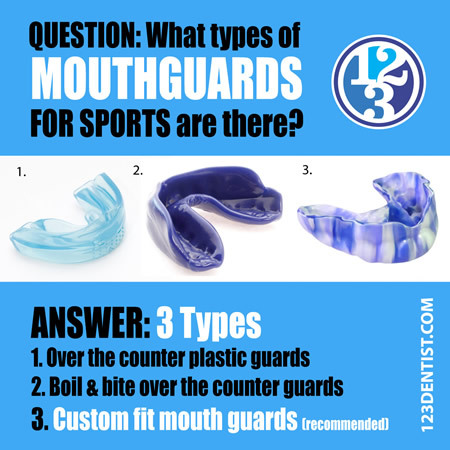 There are three main types of mouthguards designed specifically to wear while playing sports, ranging in price, comfort level, and level of protection, and leaving room for you to choose which is best for your needs. Stock mouthguards are the least expensive option but are also the least protective. These mouthguards come pre-formed and are intended to be ready to use straight from the package. These can be bought at most sporting good stores for anywhere from $3.99 to over $30 depending on the brand and whether or not it is flavoured. That’s right, these mouthguards commonly come in flavours such as fruit punch and bubblegum, but thankfully without the sugar! The main issue with stock mouthguards, however, is that because they are not formed to each individual mouth, and are often ill-fitting. This means that they have to be constantly clenched in order to stay in place, which can result in difficulty breathing, as well as jaw and tooth pain, and even a disorder called TMJ which harms the jaw muscles. Dentists in general do not recommend stock mouthguards because of this, and instead suggest a type of mouthguard that features a snugger fit, such as the types to follow. Boil and bite mouthguards are the most popular type of mouthguard as they are also inexpensive and can be purchased at most sporting good stores for under $10, in addition to the fact that they allow a closer fit to the wearer’s mouth. These mouthguards are to be placed in boiling water for a set amount of time until they are pliable, and are then put into place in the mouth and held there until cooled. The soft plastic forms to the teeth and mouth and hardens in place, creating a custom fit that should stay in place with little pressure needed from the jaw. Issues that can arise from these types of mouthguards surround the moulding process. If the mouth guard is bitten down on too hard while it is moulding to the shape of teeth, the plastic can become too thin and will either not properly protect teeth upon impact, or may break. This is quite common with dental wear that is fitted by the wearer themselves and not by a professional. These types of mouthguards generally only last a few seasons in any case as the plastic breaks down quickly due to its pliable nature. These are the only kinds of mouthguards that dentists recommend using, without reservation. 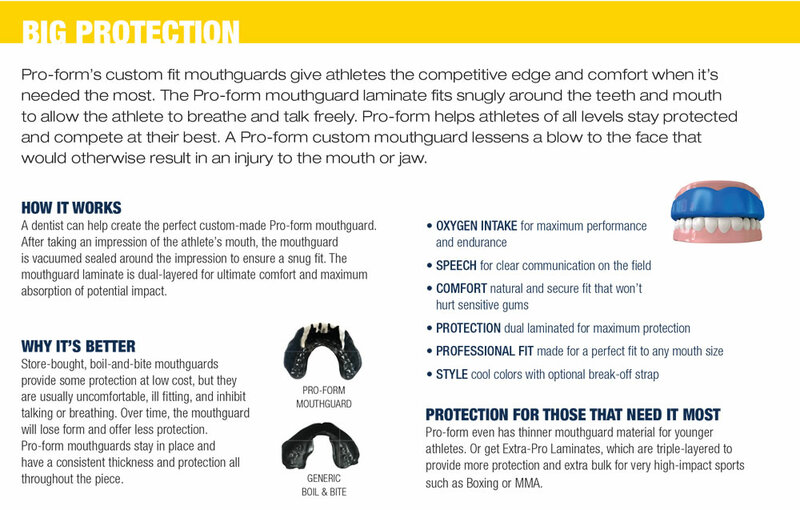 New custom-fitted mouthguards are the best option for optimal comfort, protection, and durability. These mouthguards are professionally fitted to each individual mouth by a dentist and, as a result, can range in price from $100 to $500. To make these mouthguards your dentist will make a detailed mould of your teeth and then send the mould to a laboratory which specializes in creating dental wear. There, the mouthguard is constructed out of material specified by your dentist, in order to best suit your needs. These mouthguards provide the best protection for your mouth by far as they will not lose their shape and will provide extra protection where it’s specifically needed. They are also the most durable and long-lasting option. If you are considering a custom-fit mouthguard for your child, take into consideration their age. These devices aren’t considered investments since your child may grow quickly and require a replacement within a year or two. This is where 123 Dentist comes in! There are many factors to consider when choosing a mouthguard for your child, such as the level of impact involved in the sport your child plays, the expense, comfort and protection levels, and what material will work best for them. It is always best to have a conversation with your dentist about your options as they can provide advice tailored to you and your specific needs.